'Tis the season for ghoulish delights and ghastly scares. But sometimes children (and adults) enjoy the light-hearted festivties rather than the fear-inducing elements of Halloween. We celebrated my 5-year old son's birthday, and I put together a few hours of crafts and games that are easy and sure to delight! The beauty of all of these is that they are simple, use mostly what you have around the house, and your kids can even help to create them. A twist on a classic - Halloween Bingo! 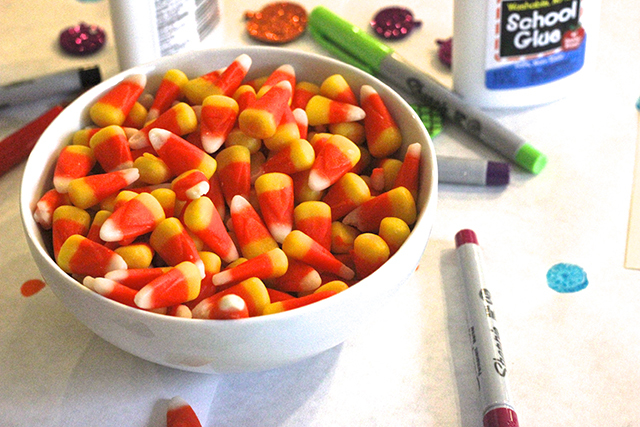 Try using candy corn to mark off the Halloween objects and characters. Even the children that don't shout Bingo when with their extra treats on the board! My favorite Halloween printable board is from The Artsy Fartsy Mama. It has beautiful illustrations, and it's easy enough for our 5 and under crowd to understand! How about a retake on the classic ring toss? Sometimes Creative had the best idea to use witch's hats! 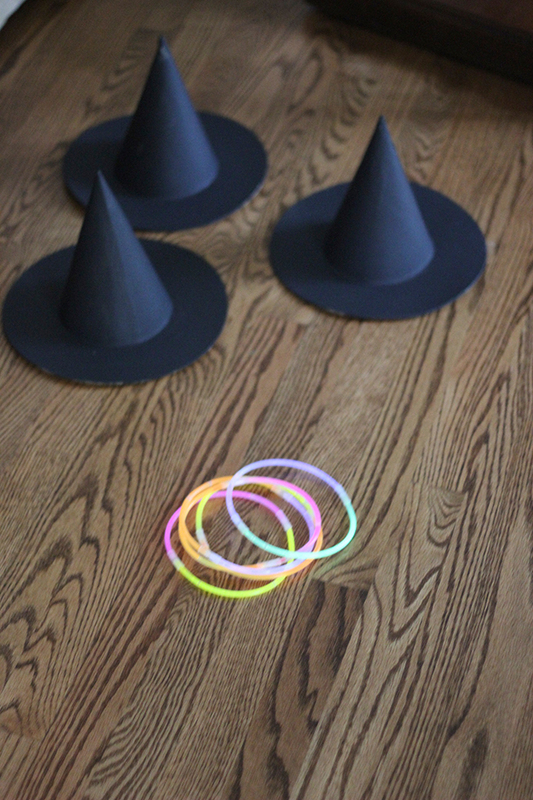 Since this was an afternoon celebration, the room was dark enough to show off our glowstick rings that made the tossing even more fun (and not dangerous for any by-standers). This would be really fun using glow in the dark (sorry, we are all about it these days) paint or tape on the hats, too, and playing it as a night-time game with the older set! 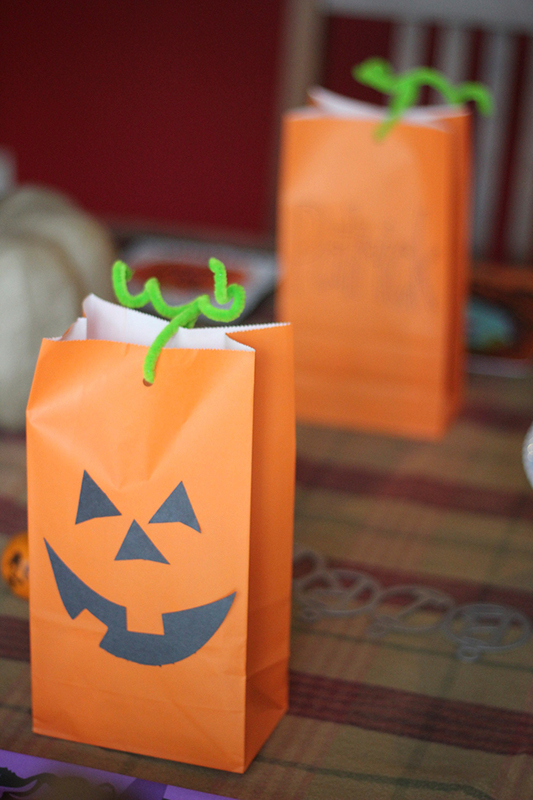 The easiest jack o'lantern treat bags can be made with an orange sack, a hole punch, some black paper, and a green pipe cleaner for the curly stem. We stuffed ours with candy, Halloween stickers, and a special ghostly flashlight! I used the same face shapes for all of the bags so it was a quick assembly line of glue to get them all in order. An easy craft for little hands to master? Bat sitters. These are construction paper, paint, pipe cleaners, and a tp tube. Buggy and Buddy made these adorable hanging bats, and we used the same process! To make the creation go easier for the children, I painted the tubes beforehand. I also glued on the eyes and cut out the wings. So, it was their job to attach the wings, and thread through the bat legs for a final winged character. 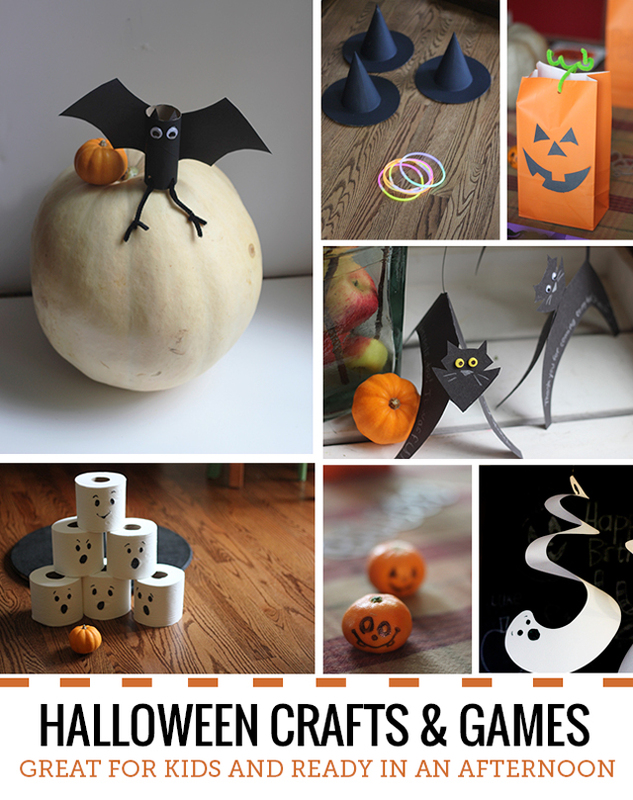 Talk about using items found around your house... how about a little pumpkin and ghost bowling with toilet paper? I saw these all over Pinterest and had to give it a try. 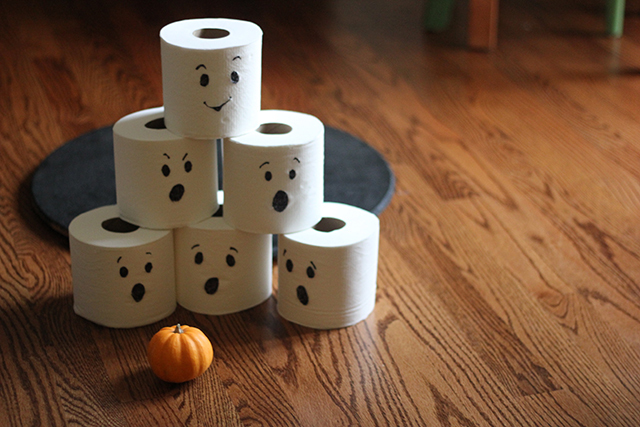 Helpful hint here: have a real pumpkin with some weight to it to toss at the ghosts because that solid three-wide stack of toilet paper is a pretty solid force to knock down. We changed the game to a throw rather than a bowl so we could watch the the tower come down. "Mommy, are you really going to draw on everything?" And why should the fun stop when the party ends? We needed some fun thank you cards after the celebration, and I thought these black cats from Parents Magazine were so clever. We made one the way the free printable (!) shows you and the other, we turned its head so that it could easily fit into an envelope. These are so fun to sit around on tables and shelves. If you run out of googly eyes (like we did) use foam stickers to make your cat have glowing eyes! We loved having our friends over to create and play! It's a wonderful way to celebrate Halloween. You can put all this together for a playdate this weekend! Our costumes are ready. We have a ninja turtle, a Harry Potter character, Dorothy, the Scarecrow, and lucky me is Glenda the good witch this year. How will you be celebrating Halloween this year?